My husband doesn't like to eat in the car. He's concerned about being distracted for even a second while traveling at high rates of speed. I must concede that he has a valid point. All I can do is wonder how he ever gets everything DONE? One time while riding with my sister, I pulled out a bell pepper and took a bite like it was an apple. Startled, she asked, "You don't cut those up?" "No," I replied, "takes too much time. It's easier just to bite into it." "Wow," she said. "I always bought those little peppers in the bag to eat in the car, because I didn't have time to cut up a big one." "Well," I said, "now you don't have to." I held the pepper out to her. "You wanna bite?" She tried it...she liked it! 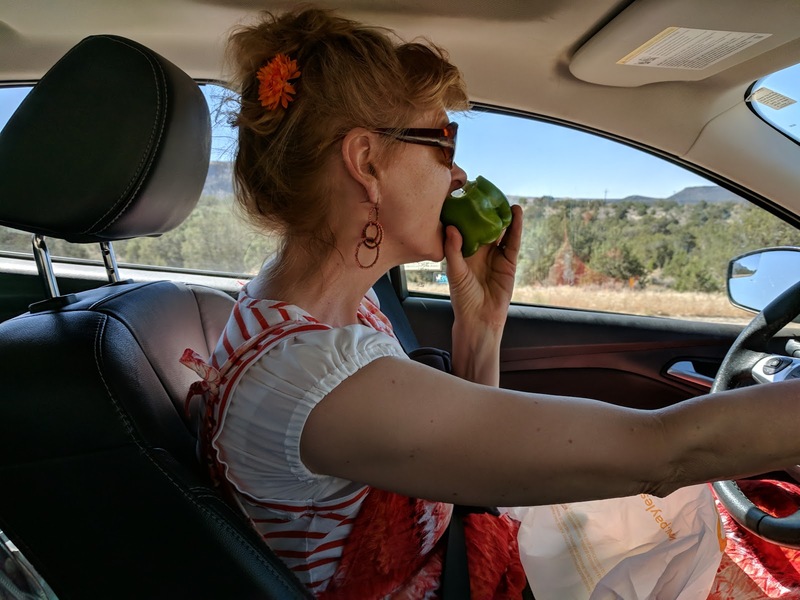 When my littlest sis Carolyn saw me biting a pepper in the car, she thought it was so funny that she took a picture. Do you eat in the car?